Ghost have announced a string of European dates for March and April of next year in support of their Popestar EP. The tour kicks off with six UK dates, starting in Norwich on March 24, and wraps up in Helsinki on April 30. The six-track title is designed as a bridging release between Ghost’s third album Meliora, launched in 2015, and their fourth full-length work, expected towards the end of 2017. One of the band’s Nameless Ghouls recently reported: “It’s a continuation of Meliora, but it’s sort of a response. I’ve used the word ‘pre-acopalyptic’ on Meliora. It’s sort of the height of civilisation, and, obviously, there has to be an end to that. He’d previously suggested the record would be completed in the spring of next year, set around plans to tour Europe, Australia, Japan and South America. 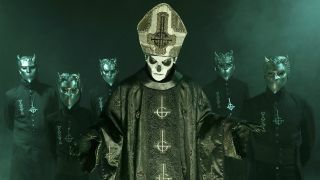 Ghost’s leader is traditionally reincarnated with each new album – and cult mistress Sister Imperator recently encouraged the Ghouls to prepare for the arrival of Papa Emeritus IV. Why are Ghost so massive in America?